I got hiking about 7am this morning. Later than I’d like, but it was in the 30s and my motivation to get out of my warm sleeping bag was minimal. Just as I started hiking up the road, two hunters drove by and stopped to say hi. They were familiar with the long trails and have seen other hikers in previous years. They let me know that they saw a another hiker camped right at the intersection I was standing. It must have been Puck. He was only 3/4mi away from where I camped. So close! 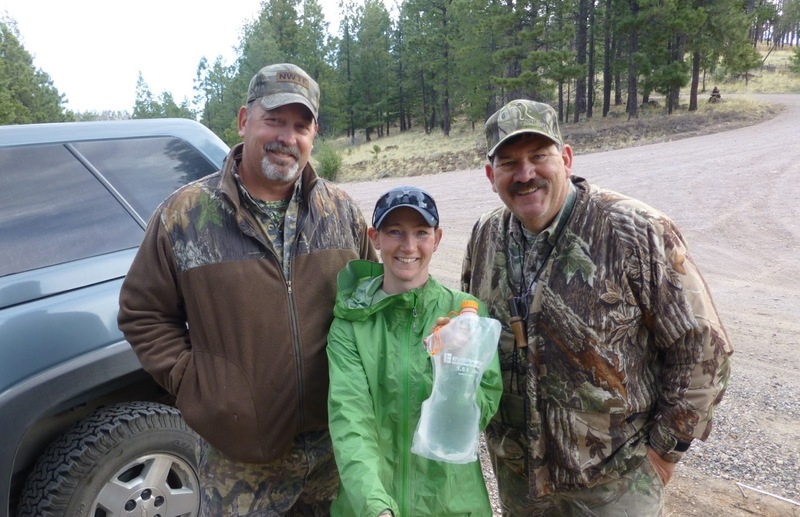 The two hunters offered me some water and I gladly took it, since water is so scarce out here this year. THANK YOU Leonard and Mark! I didn’t know then how important that chance meeting would end up being later in the day. Today ended up being one of those days most hikers on the CDT experience at least once. There were a lot of intersecting roads and trails today and my day ended up being a lot longer than planned. It started off with me getting reception multiple times throughout the morning, which is a great thing. I was excited and took the opportunity to sit right in the trail, load my emails, and call my sister and talk to my nephew. I even took an extended lunch break later in the day when I found a spot with reception and did more texting and emailing. This is one reason why I like hiking on my own. I don’t tend to stop often for breaks, but if there is service for the first time in awhile, I’ll plop right down and take advantage of it. That usually doesn’t coincide with most other hiker’s approaches to the day. However, I wouldn’t have taken such long breaks had I known how poorly the day would go. Well, it just wasn’t my day. At many intersections today, I picked the wrong turn. I’d figure it out fairly soon and have to backtrack. This ate up some time. 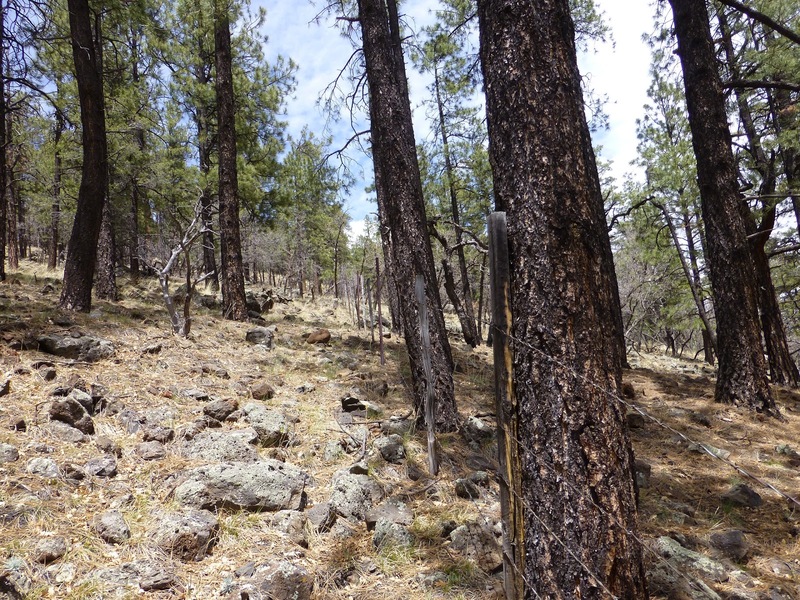 I was back on the official CDT from the Gila alternate, so I was excited about that and seeing more blazes. It was a burn area from last year, so signage was less frequent and less obvious. I was frustrated because things weren’t matching up. 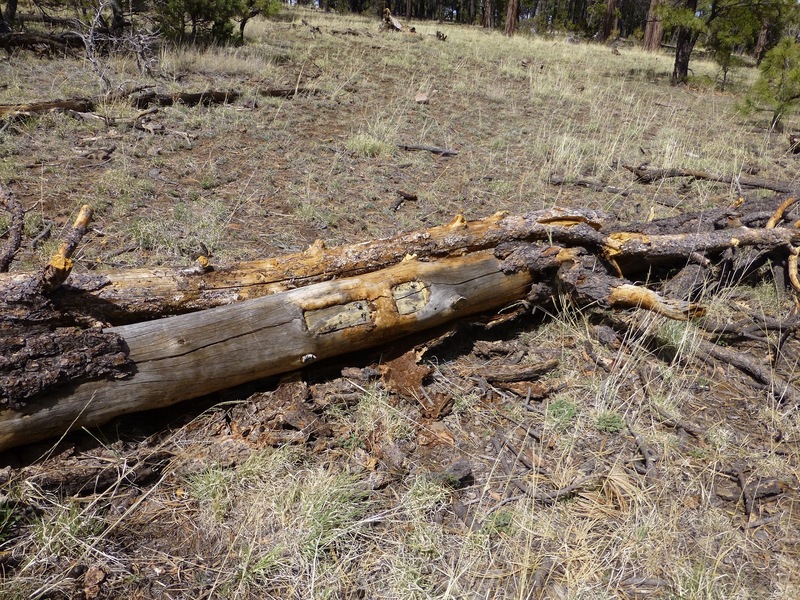 I’ve heard that there are multiple places where new trail is being built along the CDT and that they are incomplete. They just end in the middle of nowhere and I’m paranoid about it. We already experienced one such instance about a week into the hike and it makes it confusing. There is a nice new trail with CDT blazes, but they aren’t on our maps or GPS…my vote is to stick with what I have GPS waypoints for since I know that trail exists and won’t just end in the middle of nowhere. Well, we all know there is a new CDT trail in this area that bypasses the town I’m headed to in two days. Pie Town is one of the most unique stops on the trail, so most are sticking with the old route that goes straight there. Apparently, the new trail stops at the highway and it’s a difficult hitch to Pie Town. Well, at one point this morning I found myself cruising down a CDT blazed trail and then there was a water tank (big mud puddle) unexpectedly there. I checked my GPS and I was not on the route that I had waypoints for and it seemed like it wasn’t headed that direction either. I chose to backtrack to the last intersection and go the way my GPS and maps agreed with. There is so little water out here that I knew I needed to stick to what I knew. I was also confused because Puck’s usual footprints changed in a burn section with steep ups and downs and I think he put on trail runners the rest of the day unless I somehow passed him and I’m following a other hiker. He usually wears sandals and we’ve seen his prints the whole way. Whoever I was following, they seemed just as confused as me and I found his prints everywhere I went today. There was also another alternate suggested in the maps that isn’t signed that I didn’t see nor was comfortable taking. I’m thinking the others might have chosen that alternate because it had a a better chance for water and was two miles shorter. I was on great blazed trail that matched my waypoints on my GPS before lunch and thought I was golden. I got service and took an extended lunch break with my iPhone. Then I started hiking again, confident I’d make my destination. I was rationing water as a precaution, which was good because the day took a lot longer than I thought it would. The wonderfully blazed trail I was on suddenly ended halfway up a forested hill where there had been a fire in the past, probably the huge one from last year. With all the debris, there was no way to see a path or footprints. Also, with downed trees everywhere, there were no blazes…just a barbed wire fence. I realized a dirt road was paralleling the trail just down the hill, so I figured that would work…wrong! The road started turning the wrong way and didn’t wind around. By the time I checked the GPS on my iPhone, I figured it would be quicker to just cross country back to the trail…famous last words! Since this was a burn area, I was on uneven footing and having to climb over many fallen trees while going up a steep hill. It was frustrating, but I had committed and I knew it would get me back on track eventually. I think I wasted about an hour getting back on track. When I did, I was back in that burn area I was in originally. It was the trail I just needed to look harder. 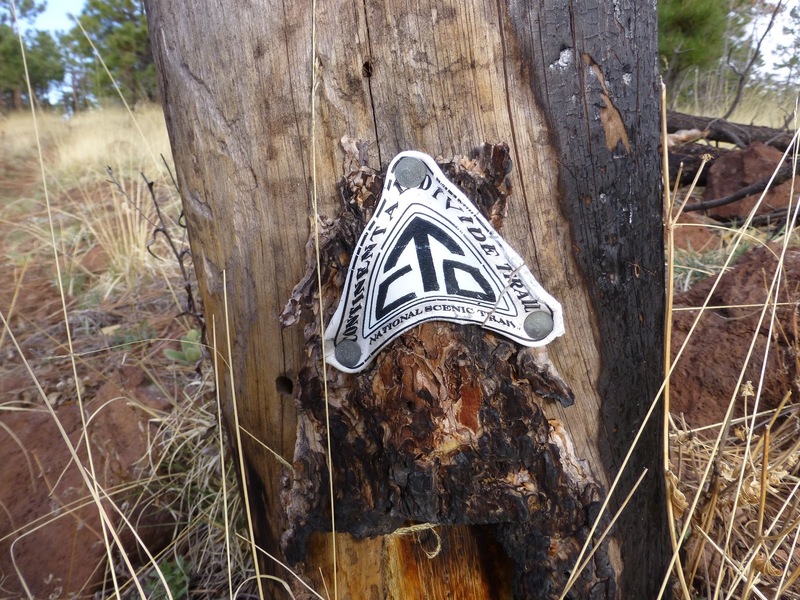 I would see cairns randomly and sometimes markings on the tree that signifies trail. But sometimes what I was looking for was on a fallen tree. Markings like this indicate trail. I used the GPS app (Topo Maps) a lot and my phone battery was going down fast. I am directionally challenged, so I tend to double check more often when I’m hiking solo. I keep a Garmin GPS deep in my pack for last resort situations. I have yet to use it all trail. I didn’t want to run my iPhone down too low, so I gave in and dug out the GPS…it was great! I couldn’t believe how quickly it loaded and how easy it was to use! I had practiced at home and never took to it, but now I think I’m going to use it more regularly instead of my iPhone to save phone battery. The main pro is that the GPS shows all the tiny roads that my iPhone doesn’t. Love Note uses the Gaia app for GPS on her iPhone and it seems to have more of the roads that Topo Maps doesn’t. One drawback on my GPS is that the maps I have loaded don’t show the small springs and water tanks that the paper maps and my iPhone shows. I soon got out of the burn area and was rewarded with my view of the day. Then I hit a dirt road that would take me to my water source for the day. I really wanted to drink the little water I had, but I wasn’t sure if the source was dry so I was rationing. My detour had extended my day, so my rations got even smaller to stretch out the water. I was actually able to call Balls who I had been texting all day. He and Sunshine did this section a week ago and he said the water source should be good. I got to drink! I still had some when I got to the windmill in case it was dry cause you never know out here. I have to say I think the water is the biggest challenge for me personally out here. It’s a mental anxiety, very time consuming to double filter, and a physical stress to take 4.5L of water (9lbs) as a precaution if other sources are dry. 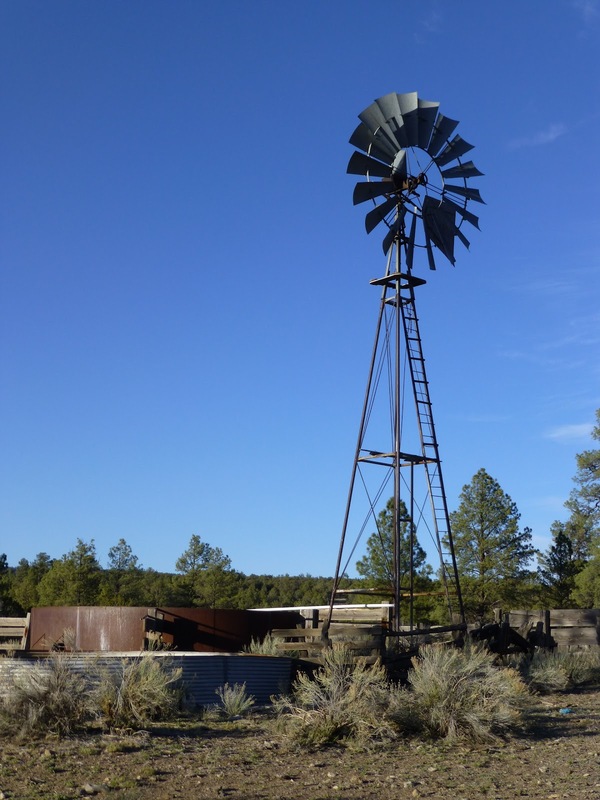 Here is the most beautiful sight I saw all day…a working windmill with water! It was later than I usually like to camp and was getting cold and dark quickly. I went to set up my tent and there were no stakes! WTF! I immediately remembered hearing the stakes fall on the ground when I set them on my pack this morning…It happened as I ran off to take care of my morning “business” and I never picked them up. They must have blended into the ground. Argh! I’m such and idiot! It really is amazing that I make it even one day out here! 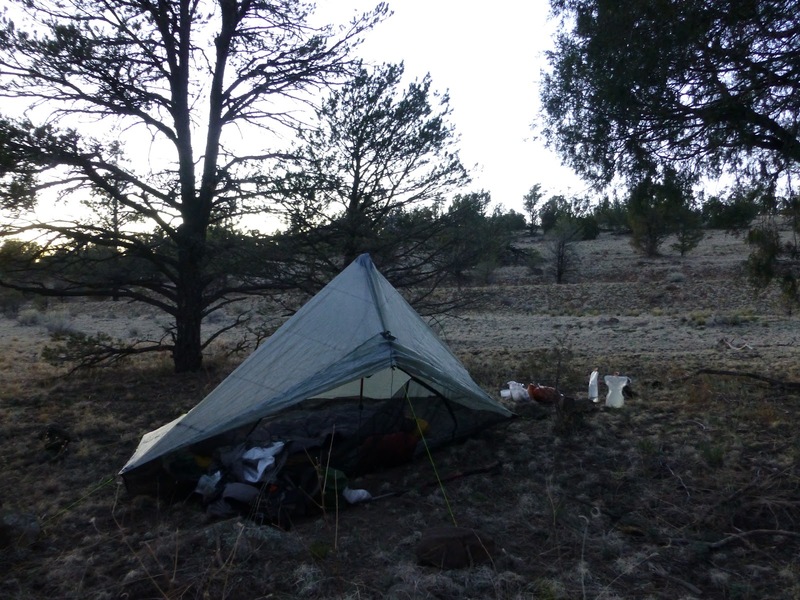 I ended up having to use sticks and rocks to stake the tent out…not a bad job! I am going to have my extra stakes overnighted to me in Pie Town, so there goes more money down the drain. So annoying! Definitely not my day!